by Rob - December 22nd, 2016. Filed under: Politics, Tube Alloys. Today’s history lesson, from November 15, 1945. Are you listening, Mr. Trump? 1. We recognize that the application of recent scientific discoveries to the methods and practice of war has placed at the disposal of mankind means of destruction hitherto unknown, against which there can be no adequate military defense, and in the employment of which no single nation can in fact have a monopoly. (a) To prevent the use of atomic energy for destructive purposes. (b) To promote the use of recent and future advances in scientific knowledge, particularly in the utilization of atomic energy, for peaceful and humanitarian ends. 3. We are aware that the only complete protection for the civilized world from the destructive use of scientific knowledge lies in the prevention of war. No system of safeguards that can be devised will of itself provide an effective guarantee against production of atomic weapons by a nation bent on aggression. Nor can we ignore the possibility of the development of other weapons, or of new methods of warfare, which may constitute as great a threat to civilization as the military use of atomic energy. 4. Representing, as we do, the three countries which possess the knowledge essential to the use of atomic energy, we declare at the outset our willingness, as a first contribution, to proceed with the exchange of fundamental scientific information and the interchange of scientists and scientific literature for peaceful ends with any nation that will fully reciprocate. 5. We believe that the fruits of scientific research should be made available to all nations, and that freedom of investigation and free interchange of ideas are essential to the progress of knowledge. In pursuance of this policy, the basic scientific information essential to the development of atomic energy for peaceful purposes has already been made available to the world. It is our intention that all further information of this character that may become available from time to time shall be similarly treated. We trust that other nations will adopt the same policy, thereby creating an atmosphere of reciprocal confidence in which political agreement and cooperation will flourish. 6. We have considered the question of the disclosure of detailed information concerning the practical industrial application of atomic energy. The military exploitation of atomic energy depends, in large part, upon the same methods and processes as would be required for industrial uses. We are not convinced that the spreading of the specialized information regarding the practical application of atomic energy, before it is possible to devise effective, reciprocal, and enforceable safeguards acceptable to all nations, would contribute to a constructive solution of the problem of the atomic bomb. On the contrary, we think it might have the opposite effect. We are, however, prepared to share, on a reciprocal basis with others of the United Nations, detailed information concerning the practical industrial application of atomic energy just as soon as effective enforceable safeguards against its use for destructive purposes can be devised. 7. In order to attain the most effective means of entirely eliminating the use of atomic energy for destructive purposes and promoting its widest use for industrial and humanitarian purposes, we are of the opinion that at the earliest practicable date a Commission should be set up under the United Nations Organization to prepare recommendations for submission to the Organization. The Commission should be instructed to proceed with the utmost dispatch and should be authorized to submit recommendations from time to time dealing with separate phases of its work. (d) For effective safeguards by way of inspection and other means to protect complying states against the hazards of violations and evasions. 8. The work of the Commission should proceed by separate stages, the successful completion of each one of which will develop the necessary confidence of the world before the next stage is undertaken. Specifically, it is considered that the Commission might well devote its attention first to the wide exchange of scientists and scientific information, and as a second stage to the development of full knowledge concerning natural resources of raw materials. 9. Faced with the terrible realities of the application of science to destruction, every nation will realize more urgently than before the overwhelming need to maintain the rule of law among nations and to banish the scourge of war from the earth. This can only be brought about by giving wholehearted support to the United Nations Organization, and by consolidating and extending its authority, thus creating conditions of mutual trust in which all peoples will be free to devote themselves to the arts of peace. It is our firm resolve to work, without reservation to achieve these ends. Text taken from the book 1945: Year of Decision (Memoirs: Volume 1) by Harry S. Truman. 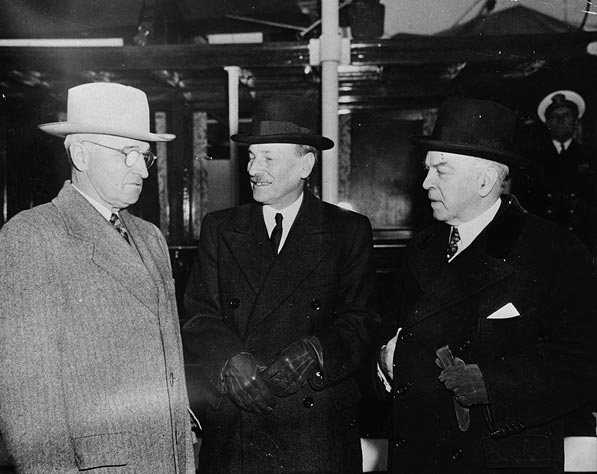 Photo left to right: Truman, Attlee, King.